If you are a citizen of one of the following countries then you do not need a visa to visit Ukraine provided your stay is for no longer than 3 months and your visit is for either a holiday or to visit friends. How long can I stay in Ukraine without a visa? The maximum stay without a visa is 90 days in every 180. So frequent visitors will need to exit the country for 3 months before returning or a visa will be required. If you intend to work in Ukraine, your stay exceeds 3 months or you are from a country not listed above then you will need a visa. A copy of the visa can be viewed here. To clear passport control a landing card will need to be filled out, you can see a photo here. You will need the address of your stay in Ukraine, it can be your friends place or your hotel. The cards are offered on most inbound flights and also available at the passport control section of Kiev Borispol Airport. It is advised that you bring your own pen as there are very few at Kiev Airport and you could be waiting in a long queue for one! 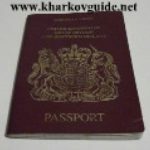 You must fill out both sides of the card before you go through passport control, you will be given one section to keep with you at all times until your departure from Ukraine.